As a follow-up to its surprisingly contemporary and hugely successful 2008 revival of Rodgers & Hammerstein’s South Pacific, Lincoln Center Theater has mounted a glorious and glamorous revival of their legendary The King and I with the same production team, reuniting director Bartlett Sher with star Kelli O’Hara. While the story and the treatment may not seem politically correct for a 2015 audience (an attempt to turn Siam into a Western culture), the production overcomes these objections with a cast that is mostly Asian and by emphasizing the heroine’s feminist views. A period piece when it premiered in 1951, and based on Margaret Landon’s Anna and the King of Siam, a fictionalized version of true events, the lush score performed by an orchestra of 29 to the original Robert Russell Bennett orchestrations gleams like burnished gold. The greatest musicals have always pitted two larger than life people from different worlds against each other and let us anticipate fireworks as well as a seemingly unbridgeable rapprochement. Take, for example, Carousel, Annie Get Your Gun, Kiss Me, Kate, Guys and Dolls, The Music Man, My Fair Lady, Hello, Dolly!, and Passion, just to name a few. The King and I fulfills this tension. Set in 1862, Welsh widow Anna Leonowens has come to Bangkok to tutor the dozens of children of the King of Siam as well as his many wives who are in favor. His goal is to bring his country into the modern world. However, when Anna is met at the dock by the Kralahome, the Siamese prime minister, she is told she and her young son Louis are to live in the palace, a clear violation of her contract. When she has her first audience with the king, he is impressed with her knowledge of his plans but refuses to budge on the issue of a house of her own which she raises. This leads to many conflicts between them. However, when Anna discovers that what is worrying the king most is the visit of the British envoy to decide if he is a barbarian and if the British should make Siam a protectorate, she offers to help with banquet preparations that will make Siam seem as forward-looking and Western as possible. This leads to a rapprochement between Anna and the king which surprises them both. A subplot which underlines the old ways of thinking deals with the gift from the King of Burma of the beautiful slave girl Tuptim to be one of the king’s many wives. Unfortunately, she is love in with Lun Tha, the scholar who has escorted her to Bangkok, and they plan to escape together eventually. Anna sides with the lovers against the wiser counsel of Lady Thiang, the king’s head wife. As these parallel stories play out, The King and I dramatizes the two sides of a culture on the brink of massive, cataclysmic change. When the audience enters the theater, the orchestra is seen in a pit. As the overture strikes up, an enormous thrust stage slides over them and a huge life size ship sails into view. Along with the breathtaking sunset in oranges and reds of lighting designer Donald Holder, the moment is coup de theatre, not often seen on our stages. While Michael Yeargan’s settings for the royal palace are stylized yet monumental, it is the sumptuous color-coordinated costuming of Catherine Zuber for the cast of 50 which gives the stage its visual splendor. Aside from Sher’s fine work with the characterizations of the leading roles, he has differentiated those of the supporting cast so that for once the members of the ensemble stand out like separate people we have come to know. He also uses the thrust stage so well that we never feel that the performers have their backs to us, a skill not all directors are expert in. Used in the previous four Broadway productions, Jerome Robbins’ choreography recreated by Christopher Gattelli, has not dated a whit. The extended numbers “The March of the Siamese Children” with its red, purple, and blue costumes and the Uncle Tom’s Cabin inspired “Small House of Uncle Thomas” with its corps de ballet in either silver or gold costumes remain eye-filling and poignant. The chemistry between Ms. O’Hara, Ensign Nellie Forbush in the LCT’s South Pacific, and Japanese film star Ken Watanabe (The Last Samurai for which he was Oscar and Golden Globe nominated, Letters from Iwo Jima, Inception and Memoirs of a Geisha), in his English language and musical comedy debuts, is palpable and adds greatly to their stage presence. In the second act sequence in which Anna attempts to teach the king European-style ballroom dancing, when he puts his arm around her waist and they begin to polka, an audible sigh of relief went up from the audience. In this reviewer’s experience of many years of theatergoing, this is the first time there was a collective reaction of this kind to the hero and heroine of a musical finally getting together, possibly since My Fair Lady. With Anna dressed in her lavender ball gown and the king in his two piece red and gold outfit, a tribute to the Irene Sharaff originals immortalized in the film version, it is a magical moment not to be missed. While O’Hara ought to be perfect casting, her performance is surprisingly muted as if playing a well-bred Victorian lady of 1862 has diminished her feistiness. It could also be the sound design of Scott Lehrer, which though crystal clear, makes all the characters seem very remote – or it could be singing over the 29 piece orchestra. Watanabe makes one forget Yul Brynner’s now indelibly ingrained performance and he gives it his own stamp, both vulnerable and questioning. While his English is still problematic, and the words to “A Puzzlement” are hard to distinguish, he becomes easier to understand as the evening goes on. Both stars create three-dimensional and involving characterizations of these very real and very human people. You will care what happens to these people. Other standouts in the cast include Ruthie Ann Miles, seen recently as Imelda Marcos in Here Lies Love, as Lady Thiang, the king’s thoughtful and troubled head wife and Paul Nakauchi as the unemotional but well-intentioned Kralahome. 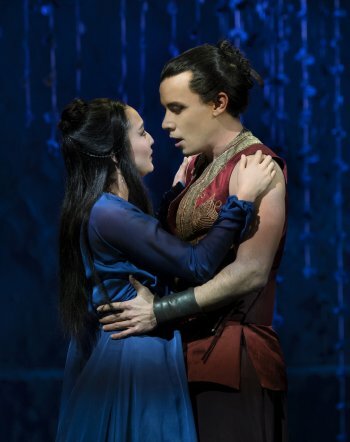 As the young Burmese lovers Tuptim and Lun Tha, Ashley Park and Conrad Ricamora (Benigno Aquino, Jr. in Here Lies Love) make beautiful music both together and separately, particularly in “My Lord and Master,” “We Kiss in the Shadows,” and “I Have Dreamed.” Jake Lucas as young Louis Leonowens and Jon Viktor Corpuz as the Prince Chulalongkorn, the king’s oldest son, still an adolescent, are extremely convincing and have a wonderful moment as they reprise the king’s song, “A Puzzlement,” in which they discover they are more alike than different. Edward Baker-Duly is elegant and courtly as Sir Edward Ramsey, Queen Victoria’s emissary. 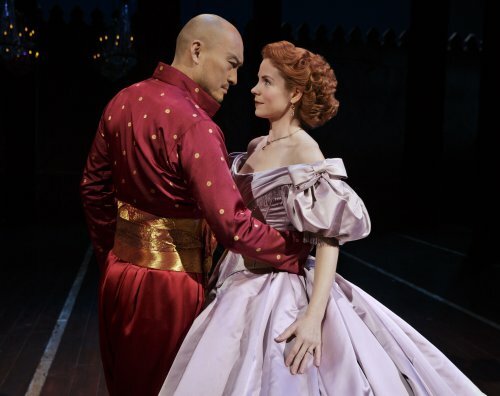 The Lincoln Center Theater revival of Rodgers & Hammerstein’s The King and I is a provocative, eye-filling and poignant experience. Both younger and older theater writers and audience members can learn a good deal about how to tell a story on stage that is both emotionally moving and makes you care about the characters from Rodgers & Hammerstein’s expert storytelling. 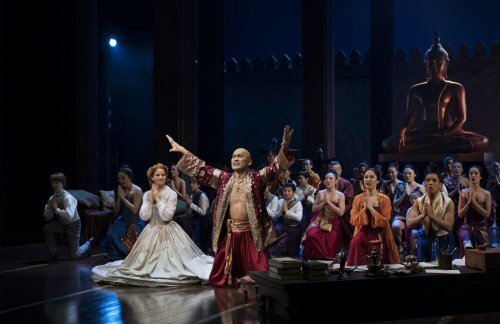 The King and I will send you out of the theater feeling that you have had a fulfillingly memorable experience filled with unforgettable songs, dances and theatrical moments. A disappointing display of the state of contemporary Asian choreography.